THPBlog: Soper Wheeler Company planning a new THP near Bullards Bar Reservoir. Soper Wheeler Company planning a new THP near Bullards Bar Reservoir. This THP is north and west of Bullards Bar Reservoir and Highway 49 in Yuba County. 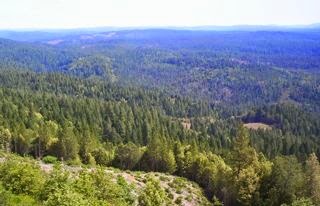 The Soper Wheeler Company is planning a tractor based logging operation in ponderosa pine, sugar pine, Douglas fir, white fir and incense cedar forests at an elevation of 2,400 to 3,900 feet. A small unstable area 150 feet long by 50 feet wide is located in section 15. 63 road drainage sites are planned for work including rocking, dip construction and culvert repair/replacement. There is a CA red legged frog 1.5 mi east of the project area at Little Oregon Creek, a foothill yellow frog 1 mi west of the THP area at Oroleve Creek, and a goshawk territory is located 1 mi north of the THP area at Moorville Ridge. More information is available on the THP Tracking Center website.